Kikay Corner > beauty products > Thiocell Lozenges Glutathione Supplement by Brady Pharma Inc.
Thiocell Lozenges Glutathione Supplement by Brady Pharma Inc.
Now, if I happen to sound a little Greek from here. You see, I have kind of done my assignment. I have not really exactly been the healthiest individual in the planet. Having to deal with chronic allergies here and there and have one birthday in a hospital bed, believe me when I say, I know what I’m saying. This is what basically pushes me to pursue a healthier lifestyle. And when I found out that Glutathione is essentially a triple threat to bodily toxins beyond detoxifying the liver, it also neutralizes free radicals and enhances the immune system. Thiocell also is beneficial for diabetic patients with fatty liver. Thiocell does not contain alcohol or animal products and contains no added sugar, starch, wheat, preservatives or artificial flavor. What is even more interesting is its being packed with “guaranteed” 500mg glutathione in every lozenge and its promise to be the most effective in whitening and anti-aging because of its unique combination of selenium, glutathione, and vitamin C. This unique combination replenishes the glutathione levels in the body and maintains it. Thiocell is in chewable Lozenges, which ensures that the glutathione is absorbed through the oral cavity instead of in the stomach, thereby ensuring faster and maximum absorption. 4. Vitamin D (as cholecalciferol) 200 i.u. 5. Vitamin E (as alpha-tocopheryl succinate) 30 i.u. The grape flavour of Thiocell Glutathione lozenges supplement makes it pleasurable to dissolve in the mouth. 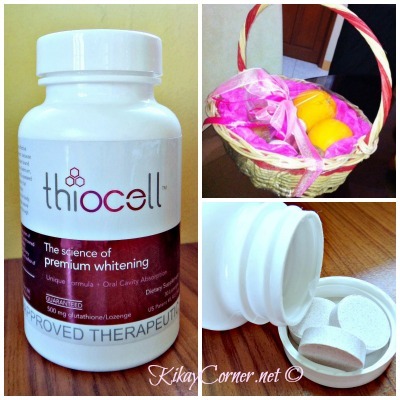 Thiocell Glutathione lozenges supplement retails for P2,400 (approx.$60). Each bottle contains 30 chewable tablets. Exclusively distributed by Brady Pharma Inc.
Hi gorgeous, it’s really nice that you have shared your review about this supplement. I haven’t tried any of the brands of glutathione due to many reasons. I might try taking it one day since I have heard a lot of positive feed back about it. Nice blog! Cheers! There are no other way to get whiter and healthier if we don’t take a risk and try doing anything BUT as regards to something that we have to take in we MUST do a double check. Researching is very important to know more about the products. So far this one is good for it has many benifits. Hi. May I know where did you buy Theocell? Is it available at leading pharmacies? I’m curious about this Lozenges. It’s the first time I’ve heard of this. I’ll try it too. Maybe it will lighten my freckles?! Is it available in mercury drugs or watson? Is it safe for people who have Thyroid problem?